If you want to win a fortune then take the Mega Fortune slot machine for a spin. 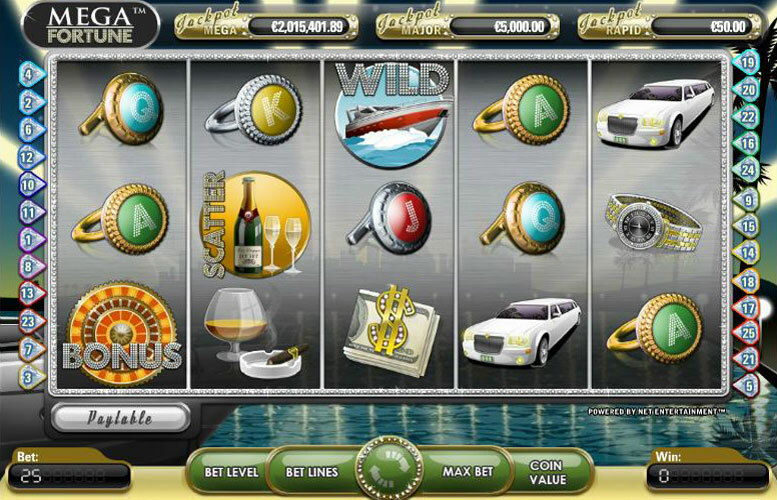 It’s another of NetEnt slots which has a progressive jackpot. The top jackpot just gets bigger and bigger until it drops. Get stuck in now before someone else nails the jackpot before you! If you can stand a lot of excitement and the constant flow of adrenalin rushing through your body then you are a prime candidate for playing Mega Fortune. You are not only going to get the chance to play for one progressive jackpot, or two, but in fact three. No matter whether it’s the Mega Progressive Jackpot or the Jackpot Major or the Rapid that you may win you are going to come into some serious coin. 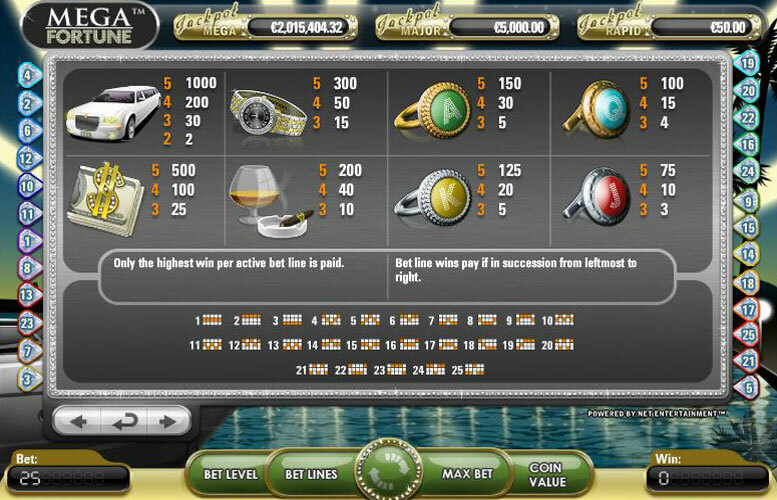 If you want to win any of the three huge jackpots that are available with this game you have to place a max of four coins on each of the 25 bet lines which means a bet of 100 coins. Next you will need to be able to spin so that the Mega Fortune scatter wheel symbol appears at least 3 times from left to right consecutively. That will take you into the bonus feature. Here you get to spin the bonus wheel. Now the object of the game is to get the wheel to stop on the tab that will allow you to spin for the next inner wheel. From this point on the 2nd and 3rd wheels gives you a chance to spin for either the Progressive or Major Jackpot or the Rapid Progressive jackpot. Also… keep in mind that during the Mega Fortune bonus round even if you don’t hit the jackpots there are still some other very lucrative payouts to enjoy. 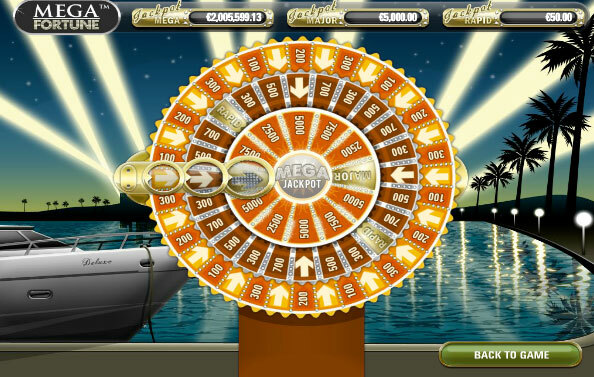 Although everyone who plays Mega Fortune dreams of hitting any one of these very handsome jackpots there are some other great wins to be enjoyed with the right combinations. The Yacht happens to be the wild so you want to see it come up as much as possible, as it fills in as any one of the symbols you may have in a winning combination if it happens to be part of it. Exceptions to this are the Champagne, the scatter, that leads to the free spin bonus game where wins are multiplied x5 and the Mega fortune wheel symbol. Another important aspect of the yacht is if you land 5 of them you will receive 10,000 coins, and for 4 you will get 1,000, and 3 will bring you 100, while 2 will bring you 10. The scatter will also grace you with some decent coin though if you get the right combinations, with a show of 5 you will get 100x of your line bet, 10x for four and 3x for 3 or 2x for 2. The limousines will pay out 1,000 coins for 5, 200 for 4, 30 for 3 and 2 for 2. If you get a collection of 5 of the money rolls, you can expect 500 coins, or for 4 100, for 3 25. The diamond watch when collected in the right combination will pay out 300 coins for 5, 50 for 4 and 15 for 3. The Brandy/Cigar pays out 200 for 5, 40 for 3 and 10 for 3. The Ace pays 150 for 5, 30 for 4, and 5 for 3. The King will award 125 coins for 5 of him, and 20 for 4 and 5 for 3. The Queen puts out 100 coins for 5, 15 for 4 and 4 for 3. The Jack is the lowest payer of them all offering 75 for 5, 10 for 4 and 3 for 3. The betting range for the Mega Fortune slot which is a 25 pay line 5 reel slots ranges from 0.01 to 0.50 per pay line. 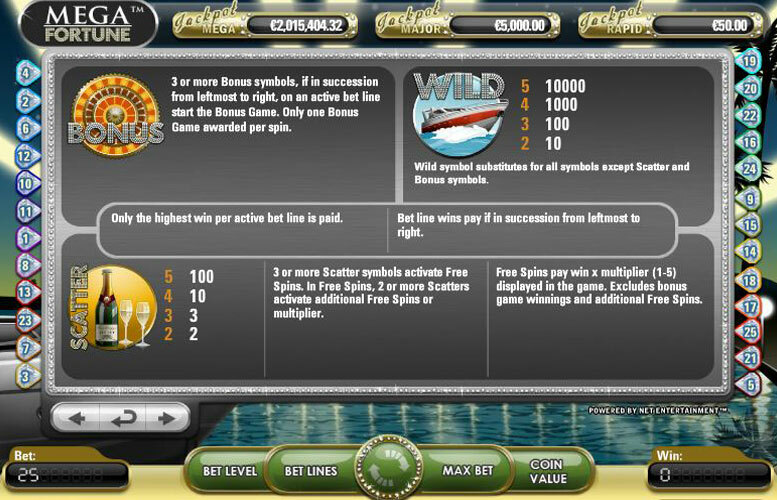 The minimum bet amount is 0.01 and the maximum bet allowed per spin is 100 coins when you set the bet level to it’s highest level 4. This game has a rating of 4 / 5 with 412 total reviews by the users.